If you've ever tried to brush your animal's teeth, you'll know it isn't the most pleasant task, especially if your companion hates the procedure. Imagine how much easier it would be if you could just pop something in his mouth that would clean his teeth simply and naturally. 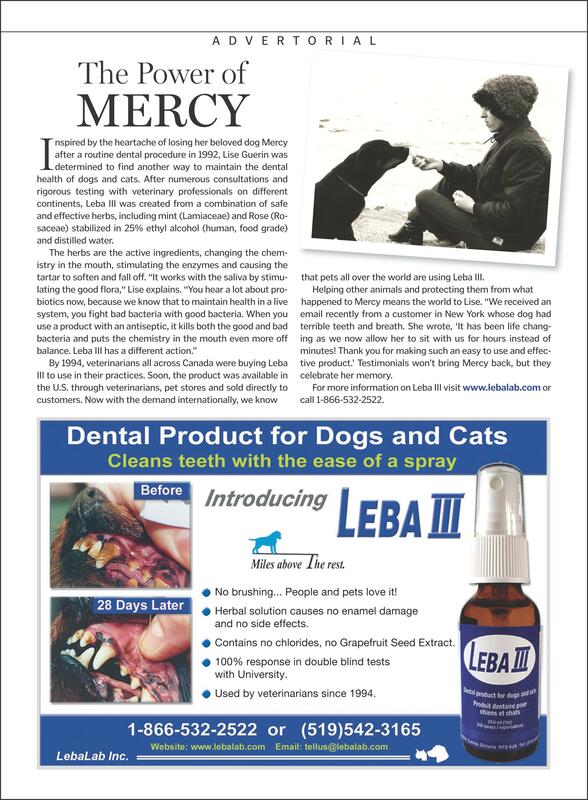 Enter Leba III by LebaLab Inc. an easy-to-use herbal product that you spray in your animal's mouth every day over a period of several weeks. Leba III works by stimulating the enzymes in the saliva and gradually cleaning away the plaque buildup that can lead to periodontal disease. The product not only does away with home brushing but also helps protect your pet from the trauma of undergoing anesthesia for a professional cleaning. This spray really works and my dog actually loves it!!!!! I work at a veterinary hospital in New York and my vet and I now recommended this to all of our patients because it worked so well on our own pets!! Thank you so very much for a fabulous product. I just want to say THANK YOU, THANK YOU, THANK YOU for Leba III. For the past 6 years my vet has told me that my Sheltie should have her teeth cleaned. I have never had the procedure done for several reasons, my number one reason being the fear of putting her under for the procedure. Also, it is very expensive to have it done. I went to a local pet food store one day and was speaking to the owner and mentioned my dogs teeth to him. He suggested Leba III. He said it’s a little costly, however, with that I said, the cost was probably 15 times less expensive and invasive than the surgery. After only a few weeks, Abby’s teeth were white and healthy looking. Her gums look fabulous too! I have told so many people about Leba III and they too are just as amazed by the fabulous results as I am. So, in closing, once again, Thank you so very much for your fabulous product. I just wanted to send you a quick email to tell you how happy I was with the results from the Leba III spray!!! The vet of my 5 yr old Sheltie, Paco, had insisted that I put him under to have his teeth cleaned and he was running the risk of gingivitis. I really did not want my dog to undergo anesthesia if it wasn't absolutely necessary and I was on the hunt for an alternative method. I found an advertisement for your product in Cesar Millan's magazine and ordered it thru a local pet store. It worked wonderfully! At Paco's next check-up, the vet had to double check his chart because it had been noted how bad his teeth were getting. I told her about your product, which she had never heard of, and she was amazed and said they looked great! I asked the vet to please check out Leba III and offer it to patients! Thank you so much for coming up with a natural and safe way for clean teeth!!! I've told everyone I know about this fantastic and every effective product! We are so glad that you found Leba III in time to save Paco from anesthesia, that would need to be repeated for the rest of his life. That is just what we are trying to do at LebaLab Inc.
Keep him on twice a day until his teeth and gums are perfect. You can try once a day after that, but some pets need to remain on twice a day all their life, especially if they have a tendency towards gum disease. It is important that you do not use other dental products with Leba III, their chemicals will destroy it's beneficial action. Thank you very much for letting us know of your experience with Leba III. Could we put your email in our Testimonials, see attached? People love to hear from other pet owners. You are on your way to a long, happy and healthy life with Paco. Subject: Re: Could we put your email in our Testimonials? Re: Thank you! Sure, absolutely you can put it on your testimonials! I, myself, read as many reviews as I could find on the product before buying! And I would like to add one more thing. The price of the product might be a deterrent at first, but once you compare that to the price of dental cleaning under anesthesia, it's well worth it. I decied to try this after seeing a advert in a pet magazine in my dentist 's office and tried it . Quincy's teeth were getting in a awful state I am now on my second bottle and his teeth are clean like they were when he was a puppy. Quincy is a 6 year old Blue Belton English setter just in case you are interested and I have told many people about your product including my vet even he had seen the difference after the first bottle. I will keep on using this product, the nice thing is Quincy does not object to me spraying this in his mouth, as a matter of fact he seems to like it. Just thought I would let you know . Our two year old Wheaten Terrier Skyler was starting to get quite a lot of tarter build up and his breath was starting to get a little stinky. When I was last at the vet they quoted $600+ for dental treatment but we were hesitant to put him through the surgery and anesthesia unless absolutely necessary. One day our daughter saw your ad in the Dogs In Canada magazine and we then found your product at Ren's in Oakville, Ontario. Although we were a little hesitant to try a new product - the staff at Ren's assured us of its safety and the success in other customers who have tried it. we are kicking ourselves that we did not take any "before" pictures because we want to shout it from the roof tops how amazing your product is!!! I cannot begin to tell you how impressed we are with Leba and the results in our precious Skyler. Thanks so much for developing it. Quick question - can it be used in humans? were and she said that they look pretty good! Wow, in 6 weeks the tarter just disappeared! chew because I believe chewing hurt. I now tell everyone about your product. Thank you so much. Soooo much easier than brushing! I have 5 miniature dachshunds and only one has all her teeth. The other 4 have all had many teeth pulled and even though I brush their teeth, the bad breath would return. This product has changed their breath and I see the tarter getting all soft and it is soooo much easier than brushing! It is incredible! I wish I had known how effective LEBA III is a long time ago. I could have saved thousands, but more importantly, my pups would have all their teeth. I am wondering if this product works for people. Can someone get back to me on this? I want to thank you for this amazing product that has literally changed the quality of life for my dog. I have a 10 year old Lahsa Apso that suffers from a severe breath condition. It had gotten to the point that it was difficult to be close to her as the odor was disgusting. I would have to put her away when guests came over not because she is a bad dog, but because of the smell. I had tried everything to help it, brushing teeth, changing food, chew toys, water additives, EVERYTHING!!! When a friend recommended your product, I was hesitant to spend the $50, but was desperate. I could not beleive the differencein only ONE DAY I have been using it for about 2 weeks and my family and I cant believe the odor is gone!!! It has been life changing as we now allow her to sit with us for hours instead of minutes! Thank you so much for making such an easy to use and effective product, I will reccomend it to everyone! all the loving and licks in that she deserves! I have a longcoat chihuahua with a wicked overbite and the worst teeth in the world. I brushed her teeth every day, but she was still having to have them cleaned and scaled almost every year, and the last time she had to have 7 teeth extracted. We were going to a new vet, and he suggested using Leba III. I have to tell you, I've been amazed! Not only is the spray incredibly easy to use, but it works! It's a year later now and I took my dog for her wellness exam today, and the vet said her remaining teeth look great! I only wish I'd known about Leba III before she had to lose all those teeth. Thank you for taking the time to read my email, its appreciated. I cannot begin to explain to you how pleased I am with your product! I have a wonderful 9 year old Border Collie named CHASE. CHASE has tartar problems coupled with offensive breath. My partner works for a pet store and this product was recommended to him. We purchased "Leba" and I must admit I was hesitant. It has not only cleaned CHASE's teeth in a matter of 10 days it has also freshened her breath! She looks forward to it and receives it twice a day. We had just been to the Vet with her and the Vet told us it was time again for dental work. 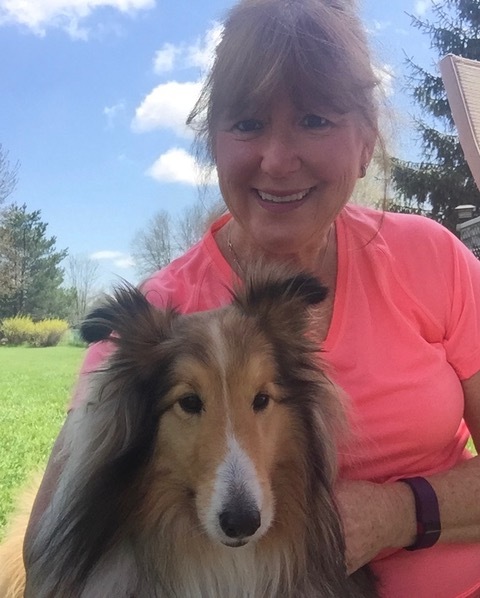 CHASE does not do well with the drugs they use for the procedure and so I am so relieved to know that she and I do not have to go through this trauma anymore! We were told by the Vet that the product would not work. Its great to know that she was wrong! The dental work is $450.00. I can't begin to tell you how grateful CHASE and I are to you and I will certainly tout your product to all of our dog friends in Toronto ! Once again, CHASE and I thank you for your exemplary product! Michael C. Roussy B. Dip., C.C. appreciated one to say the least. Lise thank you for your telephone call last week to assure me of Leba's safety. I have posted the information on our Yorkie board and a member will post it to a Dachshund board. Five year old Booker T has lived with me since April. He had a dental cleaning when I got him. He lost 4 teeth at that time and his 5 lower front teeth were loose. He needed a second cleaning in December and unfortunately he lost two more teeth. After the first cleaning I brushed his teeth every day with Oxygel and used Oxyfresh in his water. These efforts made some difference but not enough to prevent the need for another dental and loss of two more teeth. Anaesthetic is always a risk but with a tiny 5 lb. Yorkie it's frightening. We've been using Leba since his second dental on December 23 and the most amazing thing has happened. His teeth are still perfect with no brushing but more incredibly, the lower front teeth are no longer loose. Thank you for this product. I'm sure it will save lives and improve health by preventing liver and heart damage due to poor dental health. If there is anything I can do to help you promote Leba please don't hesitate to let me know. This stuff really does work! It is amazing! I called earlier this afternoon to express my satisfaction with your product. I purchased it last week and have been using it since Tuesday. One of my dogs (I have five of them) who had fairly bad tarter on Monday has pearly whites today. I wish I had taken "before" photo's to show you but quite honestly I did not expect these results. His before pictures would have looked like the before pictures you have posted on your site. Anyway, I did take a couple of "after" photo's that I have attached so that you can see how well your product has worked. (they didn't have it for very long)- the Leba III is what did it. white they almost blind you! Kim and The Wonder Pups - with pearly whites! Jack, Scarlet, Sean and Samantha"
Kimaree and The Wonder Pups-Jack, Scarlet, Seanie and Samantha"
Anyway, again I am extremely pleased with your product and wish your company well. I still cannot get over the difference it has made in less than one weeks time - it is truly a miracle product! I will continue to recommend Leba III to everyone I know. You may use any of this email or any of the photo's I've attached on your website if you like. Your product is incredible and I would be happy if my results were included on your customer satisfaction page! I cannot say enough about it - it is truly amazing! The dog in my picture is a male Whippet, 3 1/2 years old. His name is Sean. His registered name is Windyglens Diamond Are Forever. "thanks" we don't even mind the taste! So I think about 50 of our yorkie club friends are now using this product! It's been about 4 weeks for us and I am seeing a dramatic difference! Bailey and Jasmine say "thanks" we don't even mind the taste! I am emailing to find out about Leba III. I was told about it by my brother in law,whose dog had severe tartar,and after dental work,they used Leba III with what they term "miraculous" results. I asked my vet,at North Town Veterinary hospital, in Brampton, but they had never heard of it. My brother in law's vet is near Guelph, and the university, which might make a difference. I want to share my story with you. Since using LEBA III on our adorable Misca there is such an improvement in her condition (she was supposed to have her teeth cleaned under anesthetic but I was too afraid to take her to have it done). Over the last few years I have nursed and run a hospice at home and subsequently lost seven of my little angels I just wish that we had known about LEBA before! Misca adopted us on the night of the 31st of December 1999 – she is our Millennium Baby! It is our first cat that we have ever owned and I do not know what we would do without her! We started treatment on the 31st August 2005 and thanks to you and LEBA III, Misca has so much energy now – talks more – and plays with her toys. I get up at four every morning and in the last few mornings I have been woken up with Misca playing with her toys – this is a first – she has never ever done this before since the day we got her! THIS IS A MIRACLE!!! I have photocopies of the pamphlets to give out to all my family and friends and hopefully my step-son will be able to sell it for you in South Africa. Thank you for thinking of God's sweet and wonderful creatures! Once again a very big "THANK YOU" is in order! gingivitis, and consequently she always ate in a half-hearted fashion. Polly has had breathing problem when she has been "under" previously. Needless to say the appointment has been cancelled. a little bit more enthusiastic overall. although only to about waist-high. holding it down! She has never done that before! part of her has been rejuvenated, she seems to be getting younger. Her sense of smell has returned too - she is sniffing everything! The Leba III has been like magic wand - thank you so much for finding it! cats and given no more than once every five years for younger animals. you! Thank you so much, you have made us all very happy!